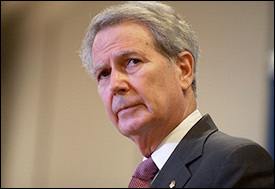 Feb. 12, 2019 — The death of veteran North Carolina Rep. Walter Jones Jr. (R-Farmville) on Sunday, Feb. 10, 2019 — his 76th birthday — has sent the state’s 3rd District into a special election that will likely last all the way to Sep. 10, and the campaign will be unusually competitive. Since the district was drawn in its current configuration in 2011, the Democrats have spent only an aggregate of $53,000 in challenging Rep. Jones. In 2018, he was unopposed. Two years earlier, Democratic nominee Ernest Reeves placed his name on the ballot but literally spent no money. During the four post-2010 census elections, Jones averaged 74.5 percent of the vote, and 66.0 percent when the uncontested campaign is removed from the configuration. But, the special election campaign looks very different and will be the first truly competitive campaign in this part of eastern North Carolina since Jones unseated then-Rep. Martin Lancaster all the way back in 1994. On Friday, candidate filing closed and no less than 26 Republicans, Democrats, and minor party candidates filed to run in the April 30 primary. With so many names on the ballot it is possible that both major parties could be forced into runoff elections even though North Carolina has only a 30 percent runoff rule. For the Republicans, 17 individuals filed including a two-time primary opponent to Rep. Jones, three sitting state representatives, and the state Republican Party vice chair. But the Democrats, for the first time in more than two decades, have legitimate contenders in a district that should continually elect Republicans. The six-person Democratic field contains two former mayors, one of Greenville, the other New Bern, and two retired Marine Corps officers. Feb. 9, 2016 — Late Friday afternoon a federal three-judge panel sitting in Raleigh invalidated two North Carolina congressional districts even after absentee ballots had been issued throughout the state and votes are being cast. The North Carolina state primary is being held concurrently with the presidential vote on March 15. The court has ordered the state legislature to redraw the map by Feb. 19 so that the primary can move forward as scheduled. The court, in ruling on a case filed more than a year ago, has thrown the primary campaigns into chaos. Republicans will immediately file a motion to stay the ruling with the US Supreme Court, but the identical move in Virginia was rejected on Feb. 1 in a similar case. The Virginia primary, however, is not until June 14, and that state has the option of choosing nominees in a convention format. The North Carolina panel ruled that Districts 1 (Rep. G.K. Butterworth, D-Wilson) and 12 (Rep. Alma Adams, D-Greensboro) are unconstitutional because of racial gerrymandering. The judges stated that the legislative map drawers did not “narrowly tailor” the districts as they sought to comply with the Voting Rights Act. Jan. 4, 2015 — Candidate filing closed in North Carolina before Christmas, and nine of the 14 federal incumbents standing for re-election will face 2016 primary opponents. Two of the challenges appear serious. Sen. Richard Burr (R) draws a Tea Party challenge from physician Greg Brannon, who placed second (27.5 percent) against now-Sen. Thom Tillis in the 2014 Republican primary. He returns in a four-way contest against the two-term GOP incumbent. Former District Judge Paul Wright and retired advertising executive Larry Holmquist are the other GOP contenders. North Carolina has 40 percent run-off law. If no candidate exceeds 40 percent, then a secondary election occurs. Sen. Burr is a cinch for the party nomination, and figures to have a strong general election performance against what will be a second-tier Democratic opponent. In 2010, Burr became the first incumbent since 1968 to be re-elected in this particular Senate seat. With Democratic recruitment failing, he is in very strong shape to win a third term. Representatives Renee Ellmers (R-NC-2), Walter Jones (R-NC-3), Virginia Foxx (R-NC-5), Mark Walker (R-NC-6), David Rouzer (R-NC-7), Robert Pittenger (R-NC-9), Patrick McHenry (R-NC-10), and Alma Adams (D-NC-12) all drew primary challengers. Only the campaigns against Representatives Ellmers and Jones appear serious at the outset. The North Carolina primary will be held concurrently with the presidential nomination event, on March 15.